It’s not unusual for a federal court to appoint a technical expert as an independent advisor pursuant to Rule 706 of the Federal Rules of Evidence. But now, in two high-pressure and high-profile legal settings, judges have taken the unusual step of appointing a 706 expert to testify specifically on valuation—in one case, to calculate damages directly for the jury. And for the first time, in Estate of Gallagher the Tax Court considered a tax-affecting analysis that included “an S Corp value premium to the C Corp equivalent value,” Van Vleet said. Although Judge Halpern (who also wrote Gross v. Commissioner) ultimately rejected the analysis for lack of convincing support, he also acknowledged the theoretical rationale for tax affecting: i.e., that most data on which appraisers base private stock values is derived from publicly traded C corps. That may leave the door open for a better-reasoned—and better-supported—tax-affecting analysis to persuade the Tax Court in the future. Was not peer-reviewed and was only sparsely supported by the expert’s report, with no supporting articles or authority. And it doesn’t end with tax-affecting. In Gallagher, the Tax Court took on a bulleted list of valuation techniques and “tough” spots, including adjustments to a DCF analysis and the reliability of the guideline public company method. To fully appreciate the impact of this case on your current practice, tune in tomorrow, Thursday, Oct. 20, as BVR kicks off its 2011 Online Tax Summit with, “Estate of Gallagher: How the Court Sees the State of Business Valuation,” featuring Chris Mercer (Mercer Capital) and attorney L. Paul Hood, Jr. Consider continuing your tax and valuation curriculum with the rest of the Summit series, including a Lawyers Roundtable on Oct. 28, followed by a Judges Roundtable: View From the Bench on Nov. 4 (both moderated by Jay Fishman); and culminating with Valuing a Majority Fractional Interest on Nov. 11, with Neil Mills-Mazer (IRS). One respondent suggested that a survey of BV appraisers might be a telling way, not to belabor any dispute, but to sound out the profession on possible solutions. To that end, please participate in our latest, quick and convenient online poll. It’s only two questions, and we’ll keep your responses anonymous when analyzing the results for next week’s ’Wire. In the meantime, business appraisers and insolvency analysts may want to take a look at the 61-page report by the debtors’ expert, posted recently on the “Ghost of WaMu.” Started in 2009 by a former WaMu shareholder who was “burned” by the FDIC’s seizure of the bank’s billion-dollar assets, the site has served as a central repository for the latest filings. “I was pleasantly surprised how well the website did the job,” says the founder (identified only as “Ghost”), who also reports that the expert for the plan objectors provided courtroom testimony only, to rebut the debtors’ report. In fact, the court ultimately credited much of his critique—including the derivation of the WACC by the debtors’ expert and his decision to give little weight to the comparable transactions analysis, which makes the “ghost” posting a solid resource, indeed. Are market comparables harder to find now? “You’re going to see more challenges on your comps from the courts, regulators, and leaders in our profession,” he added. To compensate for the lack of good comps, some appraisers are trying to replace ratios derived from recent transactions with the use of longer term multiples—although this could introduce yet another set of assumptions that analysts will need to defend to auditors, attorneys, and other users. Recent cases concerning the viability of taxpayers’ transfers to family limited partnerships (FLPs) as “bona fide” for legitimate, non-tax business purposes have been fairly successful in the Tax Court of late—even when the transfers have involved assets that don’t require active management. Estate of Black, for instance, upheld an FLP in which the partners held the critical “swing” votes on a large block of stock. Similarly, Estate of Mirowski upheld the transfer of patent royalties and related investments, and Estate of Kimball upheld working oil and gas interests. In Estate of Schutt, the court preserved the FLP in large part because it perpetuated the founder’s specific “buy and hold” investment philosophy, even though the assets were marketable securities. Look for the complete digest of Estate of Turner v. Commissioner, 2011 WL 3835663 (U.S. Tax Court)(Aug. 30, 2011), in the November Business Valuation Update; the courts’ opinion will be posted soon at BVLaw, along with every important FLP decision in estate and gift tax cases. Is your lack of desire to . . . use scientific methods that are commonly accepted in finance motivated by the fact that it may prove your conclusions wrong? BVR has made this provocative webinar into a new, free video, available here; all presentation materials are included. Summer associate hiring is also picking back up, says a recent Altman Weil post. Despite some economists’ prediction of a double-dip recession in 2012, law firms indicate that they are planning to make the same number of job offers for the 2012 graduating class as they did for the 2011 class—and some may even increase their offers. “ Law firm partners are generally confident of the legal landscape, Altman Weil adds in another post. Its Law Firms in Transition Survey 2011 finds that, overall “economic performance is rebounding, with two thirds of all firms surveyed reporting increases in gross revenue in 2010 and nearly three quarters reporting increases in revenue per lawyer and profits per equity partner.” Standard hourly billing rates are also up significantly this year, with firms reporting or planning a median 4% increase in 2011 billing rates. A similar, positive development in BV hiring. “While we shouldn't expect to return to the pre-recession level of demand, BV hiring is gaining momentum,” observes John Borrowman (Borrowman Baker LLP) in his most recent quarterly newsletter. Potential recruits might believe the recovering market might increase the potential for their working “remote” for a new firm. “Read about why not,” Borrowman says, and what “moving for the right opportunity” might really mean, for the new hire as well as the firm. The president and CEO of the AICPA challenged the SEC last week “to immediately allow U.S. companies the option of using IFRS,” according to a recent Journal of Accountancy e-report. The option of using IFRS [International Financial Reporting Standards] would be “an effective way for U.S. companies, if they so choose, to level the playing field with their international competitors,” the AICPA president said, and would also narrow the “tremendous disparity” that exists between global companies based in the U.S., and global companies based virtually everywhere else in the world. 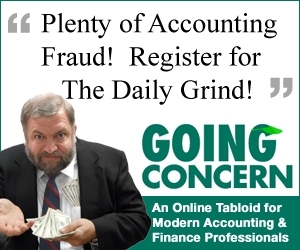 In related news, the AICPA has “has expressed profound disappointment with a Financial Accounting Foundation (FAF) proposal on private company accounting standard setting and is urging CPAs and others to weigh in on the debate,” says the latest JoA post. The BVWire just reported the FAF proposal last week, and will continue to update the proposal and the financial community’s response. Neither financial nor valuation literature takes into account the relatively short life expectancy of business enterprises. For example, fewer than 50% of new firms live longer than 10 years, says James R. Morris (University of Colorado at Denver), yet it is common for business appraisers to estimate firm value with a long-term horizon model such as a Gordon Growth or other model that holds growth constant. At the same time, most corporation statutes assume the perpetual lifespan of a business: How are appraisers to reconcile this apparent conflict? In just a week, on Oct. 26, join Morris for Life and Death of Businesses: Firm Mortality and Business Valuation, in which he discusses the “real life” expectancy of firms and demonstrates how to account for the likelihood of their death in valuations. Morris will review the most recent data on firm life expectancy and death rates, culled from the field of industrial organization, so that valuation practitioners can factor the life and death of firms more accurately into their ultimate conclusions.